I promise you will be amazed. Do you often watch too much reality tv or too many films, and finally when you have eaten your very last bit of pizza and drunk your last drop of wine or coffee you face the world – and feel that your life is a little….surreal. When you step out of your front door into ‘real world’ you wonder why people look different. Some peoples hair is just too long, too short, too untidy or too tidy. Not everyone has that perfect skin or that lovely figure you have been used to on the tv. Its because ‘normal’ isn’t airbrushed and glamorous with high end clothes. Look down at yourself or at a partner or friend – stand in front of a mirror. These are the things that are normal! In all your amazing glory, lumps and bumps. Grey bits or bald bits. Be proud of your self, you wear your life on that lovely face and body. Each lesson learned is a fine line, each laugh and joke you have shared is a dimple and each grey hair is a late night phone call from someone to go and rescue them! I accept myself – most of the time. As you grow older you become more accepting. And more importantly I live with reality! Don’t tell me you cant cook! I don’t believe in spending hours slaving over a hot saucepan making a meal, when something quick, often one-pot cooking will do. I have far better things to do! I try and make sure its healthy. It doesn’t have to have meat, but needs to be balanced, contain a variety of vegetables, some protein and some carbohydrates. The meal needs to be tasty and equally importantly – I need to be able to use what I have in my freezer, fridge and store cupboard. I don’t often use a cook book, I like to make it up as I go along. 1 bag frozen onions – cooked until defrosted, pour away excess water. Hot sauce to taste. salt and pepper. Cook over a low heat for 10 min until thickened slightly. 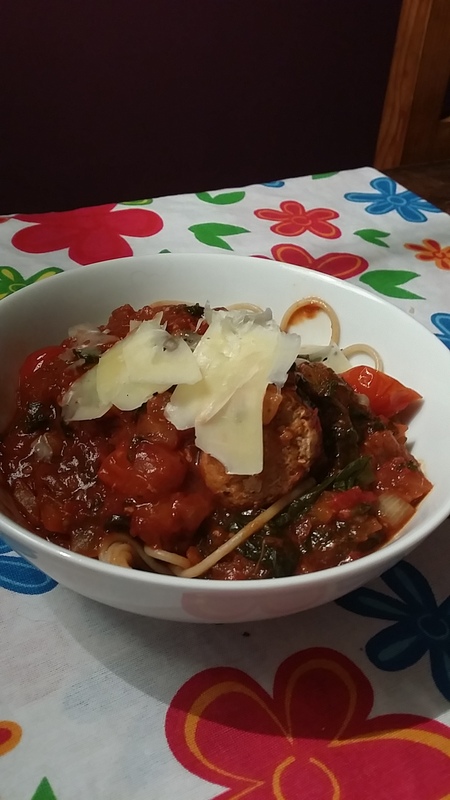 Empty a packet of meat balls into an oven proof dish, cook for 10 min on a medium heat (180 degrees), pour over tomato sauce with a good handful of olives and 3 frozen blocks of spinach and 5-10 mini tomatoes. Cook 10 min, stir 1/2 way through to break up the spinach. Serve with pasta. Few shavings of cheese. It really is easy. You need to have confidence in yourself. You cant go wrong, unless you burn it! Cook it on a lower heat for a little longer! Don’t like olives or spinach…don’t put them in, add more tomatoes, chop up some bigger ones. Use chicken, sausages or Quorn instead of meatballs. Use Worcestershire sauce instead of hot sauce. Try it…show me your dishes. Did you and your family enjoy it? Good evening – and welcome. I know this will be the first of many conversations we will have, I hope someone out in reality land will be reading this blog..I’m not in the habit of talking to myself! Don’t expect a literary masterpiece. Well, not in the first few weeks till I get warmed up at least. I love food, the healthy stuff, the 5 a day good old regular stuff. Sprinkled with some guilt inducing naughtiness. I love fashion, words of wisdom, animals – so pop along see what I can come up.